This religious tapestry "Nativity – Giotto (left panel)" shows a detail from the work of 14th century artist Giotto di Bondone (1267-1337). His most revered works are in the Scrovegni's Chapel in Padova, which contains 37 scenes from the Nativity, the Annunciation and the Last Judgement. His works adorn the chapel which was completed in 1305. Here we see the birth of the Christ child to Mary and an angel receiving him into the world. The cow and donkey are also seen here. Note the golden halos which were used to symbolise the pure and holy auras which were used to represent beings and angels of holy spirit. The style of Giotti is much loved and unmistakable, with an illustrative edge to his works yet a warmth to his scenes. 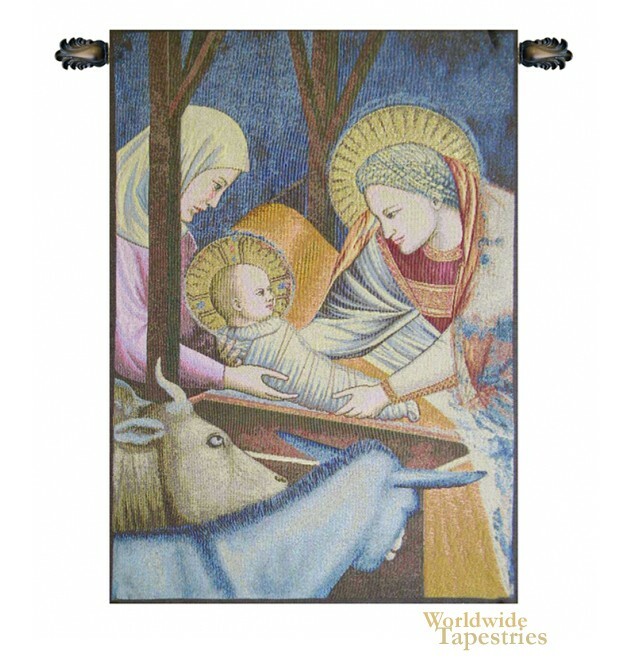 This religious tapestry "Nativity – Giotto (left panel)" is backed with lining and tunnel for easy hanging. Note: tapestry rod and tassels, where pictured, are not included. Dimensions: W 12" x H 17"